Much like mastering, mixing is one part fine art and one part technical prowess. Once your basic tracks are all recorded, they must be blended and combined (mixed) into the final stereo version. This requires equalization to fit all the instruments, vocals, and percussion together; compression to control the dynamics of the various pieces and fit them into the intended dynamic range of the music; and effects for creative control in shaping the depth, width, and "space" that each section of instrumentation lives in. To compete with the Billboard Top 100, you need a creative, professional mix of your music, combined with excellent mastering to bring out the finest details and best qualities. Mixing takes longer than mastering; a full album of songs can be mastered in a day, whereas a single song can take one day or more to mix. One of the most important advantages of having someone separate from the original engineer (or even the original recording studio) mix your songs is that you get a new set of ears to hear the project. This fresh viewpoint enables the music mixer to approach the song without any preconceived notions, and most times this makes for a better product. It doesn't matter to the mixing engineer if you spent three days perfecting the kick drum sound--all that matters is blending that kick drum sound in properly to best serve the song. And the song itself is what matters in the end, not how it came to be in tracking… the end listener will hear the final mix (after mastering) and judge it based on the songwriting and sound. So, that sound better be incredible, inspiring, and original if you want to rise above the competition and carve out your own musical identity. Much of the work with top mixing engineers involves tweaking the overall arrangement in editing, in order to paint the song in the best light, and make the mixing process as easy as possible. A lot of the initial work at Cphonic is putting up the faders, listening to what works and doesn't work, then editing the tracks until they fit together in the ideal "mix-ready" state. Unfinished edits are fixed; un-faded beginnings and ends of audio regions are repaired; drum samples are modified or changed to the best choices; and, the lead vocals are edited to perfection, removing any sibilance, mouth noises, or pops/clicks. It takes years for a mixing engineer to truly learn his or her craft; mixing is truly a blend of the fine art of figuring out a fresh approach to a song combined with the technical know-how to achieve it. 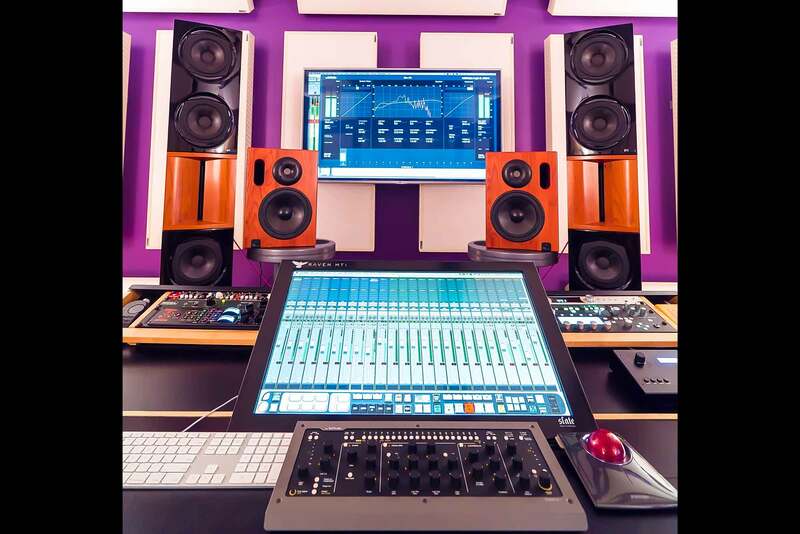 Cphonic owner / online music mixer Kevin McNoldy's Berklee education combined with his thirty years of experience as a music producer, recording engineer, mixer, songwriter, and mastering engineer makes him the ideal mixing engineer. Since he's worked from every angle of the creative process for so many years, he has an intimate understanding of each component, and can quickly shape your sound into an excellent mix. Even though Kevin can create a beautiful mix of your song on his own, the key to a truly great end result is communication along the way. Each decision he makes to design your mix is explained so you understand his approach to the emotional aspects of your song. Again, excellent sound quality is the goal, but there is a purpose behind each decision and how they enhance the intended emotion. Many mixing engineers hide these details, thinking that revealing their "magic secrets" will diminish their work, but at Cphonic we feel differently. You understand why you wrote your music, and Kevin's fresh set of ears brings that vision to life… and he can define each building block that conveys that emotion. If you're working with a mixing engineer who isn't very open about their process, are they serving your song in the best way? You have one chance to capture an audience with your music: upon first listen. So much has to work properly to grab them and keep them interested in this age of distraction. If your song is original, your lyrics have depth, and your performance is excellent but your mix suffers, you've missed your opportunity to build an audience. Both mastering AND mixing are vitally important to your professional presentation; to get either wrong would be like showing up for a job interview in pajamas, with misspellings all over your resume. If you take your music seriously, and you are dedicated to building a sustainable music career, then getting the mix right is incredibly important. Whether you're a major record label or an independent artist, the proper mixing and mastering of your project is just as vital as the songwriting itself. Cphonic's mixing price depends on the overall time it takes to mix your songs (the better your music is edited, the faster we can move), but again our rates are the best in the industry, with discounts for multiple songs/albums and caps for longer projects. In addition, we have an exclusive offer that again beats anything we've ever seen: If we mix your song, you get free mastering for that song. It doesn't matter how many songs--one or twenty--if we mix it, we'll master it for free, included in the price of your mix. Record labels and independent musicians can get the ultimate quality for their projects, but trust that the budget won't break the bank. Contact Us to discuss the mixing (and mastering) of your project… your music deserves the very best!